Ask the question: “What is the best reef salt mix for a reef tank?” on Facebook or any saltwater aquarium forum, and you are likely to get a whole host of answers. The forums are littered with complaints and praises about nearly every brand of reef salt mix. In a lot of ways, this is because there are so many good options and the results we get in our tanks are so variable, we tend to assign our relative successes and failures to things we changed, when in fact it might not be the case. What you find is that each person on these threads speaks to how much success they’ve had when switching from this marine salt a vs. that reef salt mix b.
I’m generally grateful to have the opportunity to read about their experiences, but it is often hard to discern anything scientific or even fair in their comparison to anchor to why the experience with one brand was so much better than the other. How is a saltwater aquarium owner supposed to sort through the options to make the best choice for their own tank? Put another way, how can you and decide which is the best marine aquarium salt mix for your own circumstances and budget? That’s why I put together this comparison of popular reef salt mixes–to try and give you something specific to anchor on to help you compare across brands. How do the major aquarium salt brands stack up across these important parameters? What reef salt mix do I use and where do I get it from? Looking for more reviews like this one? In addition to the fact that every aquarium owner has their own opinions and observations about how a particular marine salt mix worked for them in their tank, another challenge with comparing brands of aquarium salt is that the package sizes and the composition of the salt can vary widely from one brand to the next. Some parameters can be compared, others need to be adjusted for the size of the container. 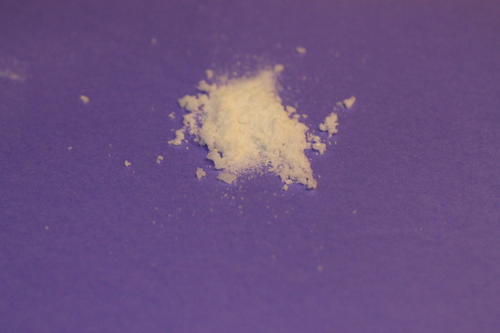 Calcium is an important component in aquarium salt. It is used by the corals and other invertebrates in the tank to build their stony skeletons. A typically recommended concentration of calcium in a reef aquarium is 400 ppm. PPM stands for part per million, which in this case means 400 out of every million parts of mixed saltwater will be calcium. When looking for the right product for your tank, take the calcium level into strong consideration. If you select a bargain salt with a low level of calcium, you’re going to have to spend additional time and money supplementing the water to get your desired levels. Alkalinity is one of the toughest things to describe in common terms. It’s a chemistry thing, related to the pH, or relative acidity of the water. Here is how it works. The scale is about comparing to ‘regular fresh water. Almost by definition, pure water is not acidic or basic, but water with aquarium salts mixed in is considered to be relatively more basic or alkaline (it has more alkalinity). Alkalinity is important because it allows us to estimate how much bicarbonate is in the water–and bicarbonate is another one of those things that are important to coral growth. The ideal range for alkalinity in a saltwater aquarium is 8-11 dkh. Which is a fairly broad range. You would want to avoid a salt mix that makes your alkalinity too low or too high or is inconsistent between batches (which would cause the levels in your tank to swing back and forth. Magnesium is one of the most abundant of the ‘trace’ minerals in saltwater. It ‘works’ with calcium and impacts the balance of alkalinity in the aquarium water. The recommended range for magnesium in a healthy saltwater aquarium is ~1250 to 1400 ppm. Since magnesium is generally readily available in a high-quality salt mix, you just want to double check and make sure that it is also abundant in the brand you choose…just so you know it is not something you need to worry about. A few of the marine salt mixes have standard ranges below the recommended levels. These are noted (in red). I don’t expect the fact that a few drifted slightly below my previously noted ideal range to be meaningful. I doubt there are any data, anywhere, to suggest those levels are demonstrably less effective than the rest of the mixes. So while you may be inclined to make a decision based on that (and you might as well, you don’t have a lot of other information to go on), I also encourage you to not to over-react in the event the salt you are currently using (or intended to use) is on the low end of the list here for any of these values. If I observed an issue in my tank that I suspected of being related to a value…like alkalinity…for example. I might test out a higher alk salt to see if it helps and go either up or down on the scale to see if that makes a difference. 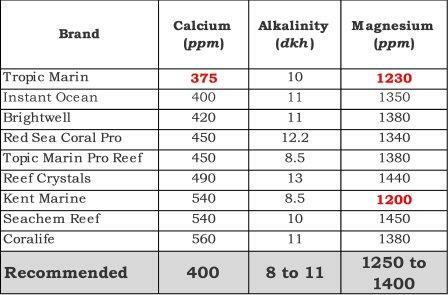 If I was dosing one or more of those nutrients into my reef tank, and I knew how quickly my tank depleted those nutrients, I would use it as one additional factor into calculating the cost (or cost savings) of one salt versus another. Since all of the major salt brands listed above have the most important water parameters covered, one could make an argument that there is no single best aquarium salt mix and that they are all pretty much the same (I suspect the marketing brand managers would cringe if they read that). One thing you can objectively compare is the cost (I probably made the marketing managers cringe for a second time there). At first glance, however, it can be slightly challenging to compare the cost across salt brands, because the standard ‘bucket’ of salt can make 150, 160, 170 or even 200 gallons of saltwater, depending on the manufacturer. That makes the match nearly impossible for the average person (average dimwit writing this article, at your service). What I recommend you do to create a fair comparison is to take the price per bucket or box of salt and divide it by the number of gallons per container to determine the cost per gallon. Here are a few hypothetical prices for each of the brands listed above that are approximated based on what I’ve seen. Please note, prices can fluctuate a bit online, so it’s typically best to go to the websites directly to do your own math and get the most accurate number. Below here is an example calculation based on some reasonable pricing estimates. By creating the cost per gallon metric, it becomes a little easier to tell if the $77 bucket of Tropic Marin that makes 200 gallons is a relatively more or less expensive option than the $77 bucket of Red Sea Coral Pro salt that makes 175 gallons–or if the $40 boxes of Instant Ocean and Kent Marine Reef Salt are the same. In the table above, I calculated the cost per pound of aquarium salt mix and the cost per gallon of mixed saltwater. You also have to consider the cost of supplementing your aquarium water, to determine the best salt mix. If you have a lot of stony corals (SPS or LPS) or clams, you may notice that the calcium levels in your tank steadily decline as the animals inside your tank deplete the natural calcium levels to build their stony skeletons and shells. In that instance, you probably want to supplement your aquarium water with a calcium reef supplement like kalkwasser (calcium hydroxide). Those who regularly dose calcium in your tank, you would benefit from doing one further quick cost analysis when picking the best aquarium salt mix for your reef tank. So while my analysis above is just a straight cost per gallon, I encourage you to do your own math to figure out an ‘all-in’ cost per gallon once you account for supplements, if you add any. If, for example, you buy Tropic Marin salt (at $0.39/gallon) and you routinely add calcium to your tank in the form of kalkwasser at an additional cost, it may be reasonable for you to consider switching to a brand like Seachem ($0.33/gallon), saving money and raising your calcium concentration by 165 parts per million–you may find you no longer need to add a calcium supplement between water changes, in that instance. So what is the best reef salt mix? For me, the best reef salt mix, of all the salts om the market, when you weigh all the various factors, is Instant Ocean. 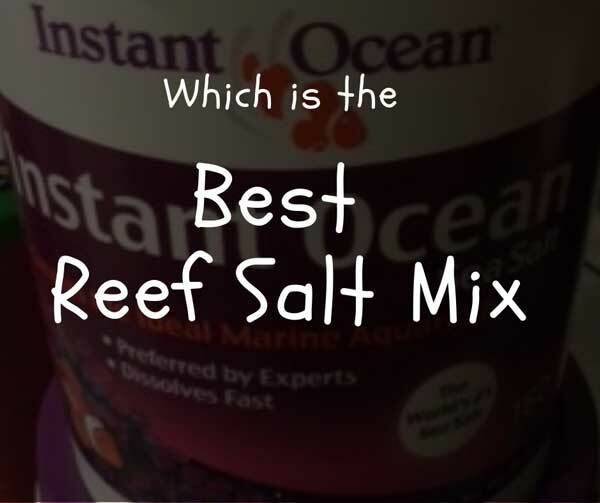 Why is Instant Ocean Salt Mix the best? Instant Ocean Salt Mix is the best, because it is a great quality product at a reasonable price. That’s the brand I use. I tried to ‘upgrade’ to the Reef Crystals brand of salt (also made by the same company). I can report that I didn’t personally see any benefit to that more expensive brand compared with Instant Ocean Brand. For the last several years, I’ve purchased my salt from Amazon.com (affiliate link). No more lugging around buckets. The buckets come shipped directly to my door. No more drive time. No more hassle at all. And when the bucket arrives, I’m giddy, like a little kid on his birthday. 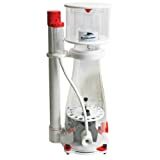 The product is Amazon Prime eligible (which means they will send it via 2-day shipping for free for Amazon Prime members) and also qualifies for their free Super Saver Shipping option too. What a great deal! You couldn’t beat that with an Acropora (get it? nickname..stick…). If you decide to buy a bucket of salt or any other product on Amazon after clicking on one of the affiliate links above, I will earn a small commission. No pressure at all. You can find the same products, at the same prices by searching on your own, but thank you if you decide to use one of the links to make a purchase. Every little bit of support helps me continue to produce this website. How about you–what do you think is the best marine salt mix and why? Please leave a comment below to let us know what your experience is. This is a fantastic article, great job. Thanks, Colette. What brand of salt do you use? Why doesn’t anyone make a liquid concentrate sea salt for reef tanks that is competitive in price per gallon ? I would be a buyer for sure. Hi Barry, I am aware of one brand of liquid concentrated salt mix, but I have never used it–because, as you point out–it is so expensive. The product costs ~$10-$12 for a a solution that makes 4.5 gallons of saltwater. That means it would cost over $400 to make 160 gallons, which is how much a single bucket of Instant Ocean makes. 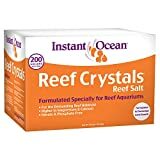 I’ve bought Instant Ocean salt on Amazon for anywhere between $25 and $40, with free shipping. I’d love to learn more about why you’re interested in a concentrate–what are the benefits, from your perspective? Thanks again for the thought-provoking comment. I tried Sera Meersaltz, Instant Ocean, Tropic Marin, HW Bio-Marinemix, Red Sea Pro, Marine Environment, Australian marinemix and recently BioSea Marinemix. I had inspiring results from Red Sea Pro and Marine Environment in keeping both lps and sps corals. Of all so far, the Australian brand was the worst from a consistency or quality perspective. Thanks for sharing your experiences and recommendation of the Red Sea Pro and Marine Environment. When you mention the Australian marine mix–could you clarify what you noticed, from a consistency perspective? What were you testing for and what were the results? thanks! Thanks for the article. It would be useful to know to what specific gravity each mix makes. This would change the cost per gallon. The Instant Ocean 200 gallon bag does not make 200 gallons of 1.023-1.025 SG saltwater. Hi Ron, that’s a great point, the Instant Ocean label states that 1.5 pounds of the stuff makes 5 gallons of seawater at 1.022, not 1.023-1.025 as you point out. I’ve been using instant ocean reef crystals (orange) and i like it so far but am thinking o f changing to red sea pro. My calcium always needs topping up and i seem to get less gallons from a bucket. I am going to check out Amazon. Thank you for the tip! Thanks for the comment, Kym. What do you mean, when you say you get less gallons from a bucket? I Don’t seem to get the gallons i should be able to get out of the bucket so maybe i mix my salt at a higher level than they base it on the label? I don’t have any problems with the salt itself though i just thought that i would like to try one with higher levels of calcium and magnesium seems good. Thanks, Kym, I understand now. The Reef Crystals reef aquarium salt mix you use should make the listed number of gallons of aquarium water at 1.021-1.022 specific gravity, which is likely lower than what you are mixing your saltwater to. If your water is 1.025, it means you are using more salt to get there. I don’t think it means there is anything wrong with the salt mix, just that they are picking the statistic to show on the package that makes it look like it makes the package seem larger than it really is (unless you are keeping a fish only aquarium at 1.022 specific gravity). If you are adding more salt to get the specific gravity up (like most of us do) then your ‘true’ calcium and magnesium levels will be a bit higher than what is stated on the label, too. With all of that said, picking a salt with a higher calcium and magnesium level so you don’t have to supplement as often also makes sense. Let me know how your new aquarium salt mix works. Thanks for the comment/question. I appreciate you for taking the time to connect here. When it comes to supplementation, it is just math–supply and demand for each nutrient in your tank. For example, how high do you want to calcium levels to be in your tank, how much calcium do the inverts in your tank ‘consume’ and how often do you perform water changes. Some salt mixes have higher amounts of Calcium (or magnesium) or create water with a higher ALK level that will go down over time as your inverts pull the elements out of the water. Red Sea Coral Pro is higher than some, lower than others. I suppose if you were to act very literally in line with your goal of ‘no dosing at all’ you would pick the salt that has the highest levels of whatever your tank demands the most of (eg. Calcium) and schedule your water changes to keep the levels where you want them. The trade off is in the time and cost of the water change versus the supplemental dosing. If your water quality is otherwise high, you may find it easier to dose than to water change, but that’s a personal choice. How does that sound, what do you think? Thank you Albert. I really enjoyed this article. I just wish there was more testing , even some consistent basic tests included instead of relying on sometimes exaggerated data supplied by their marketing department on the packaging. I have been in this hobby for over 15 years and I believed we still do not know everything. Regarding salt mix and which products are better, well for a start there will be new products promising some new miracle or extra elements just to ensure they will get more customers especially newcomers. For my coral (lps and sps) tank I had success using Red Sea Pro, Aquacraft MarineEnvironment and Reef Crystals. Good quality test kits are necessary to ensure basic elements are supplemented every now and then, as time goes by. The worst product was Aqua Forest Probiotics which caused bacteria bloom and unwanted parasites to thrive if not used soon after the mix has been completed. Although it mixed very fast, I decided the probiotics was no better than using a drop of cheap brown rice vitamins into their salt mix. I emailed to Aqua Forest and had no support other than a robotic response to contact your local supplier. My supplier told me he was powerless to do anything and instead recommended me to use Red Sea Pro or continue using MarineEnvironment! Another product that I avoid is Aqua Ocean Sps Premium. I had terrible inconsistencies using 3 bags of it. One bag had very high magnesium and the other had low magnesium and the other has deficiency in calcium. Hi Thomas, thanks for the comment and compliment. I’m glad you enjoyed the article. Thanks for sharing your experiences with those other salt brands. Agree with you that having more data with respect to testing would certainly help differentiate. Good points. Hi Marcy, I’m glad you found the site too. Sorry to hear about the challenges signing up. Not sure what the deal is. I’ll try to add you manually. Thanks for reading the books and using the journal! Great article, I’ve tried every salt listed and few others over the past 10 years. The current craze seems to be Fritz , I tried some, nothing bad to say about it, but decided to stick with my favorites. Instant Ocean and Seachem. I am surprised to see Seachem discontinued after clicking link above. I am hoping the new Vibrant sea has same quality/price. I use Instant Ocean for fish only, but prefer Seachem reef for mixed tank/hard coral the main reason is I find it keeps ph higher and seems the ph is more stable and consistant batch to batch. Conrad, thanks for sharing your experiences. You’re right, it does seem like there are ‘hot’ brands that come and go–Fritz does have some buzz. I’m not quite sure about Seachem’s choice to discontinue–it will be interesting to see if the new brand (Vibrant sea) becomes popular. G’day Albert. I like to congratulate you on this fine article here. Not only it is very informative but also useful for newcomers too. We been in the aquarium business for more than 2 decades and if there is one thing that a lot of people ponders for the first time frequently is which salt to use and which is the best. All we can say is to use a known brand first and then venture to others later if necessary. There are quite a growing number of brands around all promising to be superior in something. However problems can arise when a person starts to modify by adding calcium or magnesium or others without accurate dosing. Today there seem to be synthetic formula types and evaporative salts mixes. One of the main problem in using evaporative sea salt is it depends on the currents in the ocean and seasons or if it was derived from desalination plants where maintenance program can have an effect. Regardless of the final blending process, it can affect some batches. This is one grey area where a lot of people are not aware when using solar evaporated salts especially for critical purposes other than general home cooking. Albert, have you tried other new marine salts lately? G’day Danny and thanks for the comment. I’m a big proponent of not changing things that are working well in this hobby. I’ve had problems, in the past, when switching aquarium salt brands (even when switching to a ‘superior’ brand). My tank is doing fine as is–so I still use Instant Ocean. If I was having problems, I would not hesitate to try something new, but in the absence of a reason, I’m not looking to change that up. Thanks for the comment–sounds like you’re in the salt business? First, thank you for the great info. That said I was a little disappointed that you didn’t include Fritz Pro Aquatics Reef Pro Mix in your comparison. Mainly because that is what I use and you actually have a link in the middle of your article for the product. Since I now have all the info for the other salts, it will be easy to add Fritz the mix to see how it stacks up. I use it because it devolves much faster than other I have used, which is half of the ones on your list (IO, RS, RC, CL). Thanks again! Rob, thanks for the comment–and for sharing your preferred brand. I will add it to the list! Great article. I’ve been caring for aquariums for over 2 years now and starting to do more and more saltwater aquariums for clients and I’ve never taken screenshots faster when seeing the charts for calcium, alkalinity, magnesium levels and the prices for different brands to show people and give a visual when explaining things when they are new to the hobby and all the info you are telling them gets to be a bit overwhelming. I’ve already switched a couple people’s tanks over to another brand to keep certain levels a little more stable from what they were using. Saved me a lot of time from looking elsewhere online. Thanks again for all the info!!! Bob, thanks for the comment and glad these resources have helped you and your clients! I use a mix of NSW and Red Sea coral pro witch I buy from Red Sea direct as I live where it is manufactured.I get good growth on my clams and my SpS with this mix that I have not gotten with any other mix my amount extra dosing has also gone down. Oliver, thanks for sharing your preferred mix! !